In turn, households get the feel-good illusion. Despite all the frothy excitement about the stock market’s new highs, and the drooling today over the new highs reached by Housing Bubble 2, exceeding the prior crazy highs of Housing Bubble 1 even according to the Case-Shiller Index, and despite eight years of super-low interest rates, and a million other things that are hyped constantly, median household incomes, the crux of the real economy, is still a dreary affair. Sentier Research released its median household income measure for October today. Adjusted for inflation, it edged up 0.6% from a year ago to $57,929. But it’s down 1.3% from January 2008, and it’s down 1.5% from its peak in 2002. The Census Bureau publishes household income data annually in mid-September for the previous year (the 2015 annual data was published in September 2016). Sentier Research uses Census data and publishes monthly updates, adjusted for inflation via the Consumer Price Index (CPI). We continue to monitor the course of inflation, as this has a significant effect on the trend in real median annual household income. In addition: Even minuscule but consistent understatement of CPI in relationship to actual price changes as experienced by the median household wreaks havoc on their inflation-adjusted income. Since 2000, official inflation has amounted to 42%. If CPI is understated by just a fraction every year, multiplied by 16 years, it would knock several percentage points off real median household income. This translates into reduced purchasing power, which is exactly what many people have been experiencing. For the Fed, “price stability” means ingeniously 2% inflation, based not even on CPI but on the core personal consumption expenditures price index (PCE), which mostly trends lower than CPI and thus shows even less inflation than CPI. And the Fed keeps hoping that people are fooled by this idea that they’re making more money when in fact, inflation is eating up the gains, plus some. So for the first 16 years of this millennium, real median household income (as adjusted by CPI) has been mired down at a lower level than at the end of the last millennium, and remains 0.6% below it. 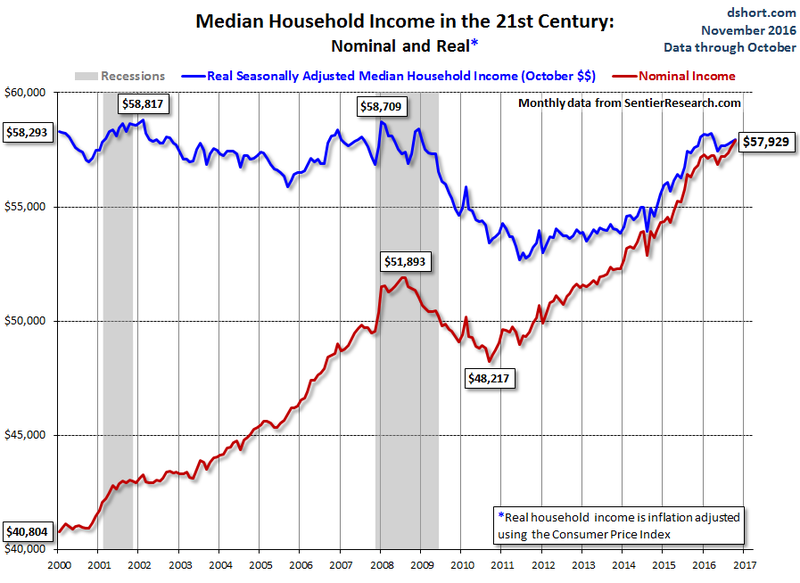 While the nominal income – the feel-good one that the Fed wants the people to believe in – has soared 42%. Wages not keeping up with inflation is the easiest way to cut the cost of labor. And companies don’t catch the blame; they can give raises to make people feel appreciated. In turn, they raise their prices and thus increase their revenues and profits, while strangling the purchasing power of these people. OK, I get it: Every company clamors for cheap labor to maximize its profits. But in the end, an economy that is based on consumer spending has trouble growing if the purchasing power of these consumers is sinking into an endless inflation-induced wage-quagmire. So yes, the holes left behind by declining purchasing power can be filled by taking on debt – and that too is the Fed’s preferred method: to push consumers to make up for the loss in purchasing power with additional debt that they then can never get out of. ← Sudden, Infectious Enthusiasm for “Current Economic Conditions” after Trump Called them “Terrible” for Months? Conclusion or delusion is the result of misinformation or denial, that’s pervasive in these times. Sadly the majority of the public are only misguided due to lack of enough real data. If all a person watches is the news for an hour at 6:00 to 7:00 and again at 10-11:00 for 30 minutes every day they are doomed to my opening premise. The devil is in the details, figures don’t lie-liars figure, action speaks louder than words, etc, and many other cliches, are needed to ferret out the truth. I say this as a critic, skeptic and a cynic for most of my adult life, circa age 24- now 67 young. So true. One of the reasons I visit this site. Wolf does a lot of the deep dives. 30 minutes here is better spent than watching anyone’s newsfeeds all day long. This site is for truth seekers only, and the comments here are what made me come back almost everyday. Surprised there aren’t many paid shrills trying to poisoning the site yet. The pump don’t work cause the vandals took the handle? Job creation is being held hostage by the fearless industrial titans who believe everyone is being paid too much? The fed is holding back 5 trillion tons of coal ash which is the waste of human dreams and when it blows? It will take more than some little QE ? The next QE will have to be massive and there goes the trust fund! 5 trillion fed balance sheet which will destroy social security? You pay for both yet control neither! This article doesnt even begin to tell the real story. These days most workers fund their own retirements as defined pension have disappeared. Family health insurance is no longer a benifit from the company. Only the employee gets insurance. Lots of employees dont even get that since they are not working full time. Not working full time wont get you vacation time or holidays. Interest rates are cheaper but not really since the price of the home is up 600% from 25 years ago. Most of the interest is not deductable since you have a higher standard deduction today. There are far fewer write offs for the average worker today. No wonder I’m so broke all the time, i made more in 2000 than i did in 2015 so that means my purchasing power compared to 2000 is…….never mind, it’s too painful. This ‘ol man finds he needs to compose in a word processing doc. and paste here and still doesn’t get it right! I understand. But this is a comment section, not a spelling competition. As every reader here knows, I make plenty of mistakes in my articles and my comments, and I DO HAVE an edit button. I’m so glad the “spelling police” don’t spend much time here!! Many times it seems that as soon as one make a good point their spelling and/or grammar are attacked. Night-train nailed it. Wolf has created the perfect forum here. We get real time updates and analysis that won’t surface in traditional news, assuming it’s not throttled due to an agenda, in 2 days, maybe 3. Plus we get to interact and bat the piñata around, something just not possible in the MSM. How many places can you go these days that indulges critical thinking? A handful. But I do not worry on that score. Critical thinking seems to be coming back into vogue. 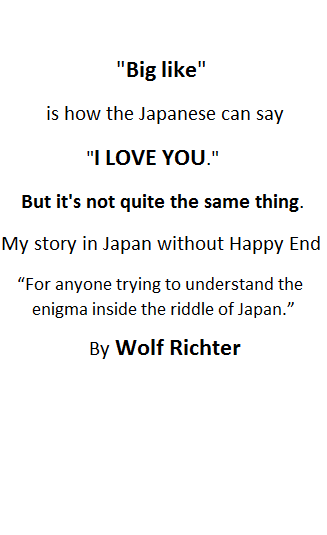 Wolf, I love your website! It is the first place I go to when all is quiet in my house and the coffee is fresh and my beautiful wife is still sound asleep. It is 5:00 am. As someone just prior to this note says, “your deep dive” makes it clearer to me where we are headed. My brain at 75 has turned to mush so I treasure clear and I hope unbiased reporting. Please keep up your good work. I also smile when I read your good work on other websites, e.g. Business Insider, That means other, smarter people agree with me. You future; At lesst 10 more years of bliss here. THANK YOU for your very kind words. Music to my ears. I guess Europe has been leading the way, many years before even. What I see in much of Europe is similar to the US, only the rot started earlier. We have the same bogus inflation statistics and I’m sure that for many real incomes are lower than even 25 or 30 years ago. One of the problems though is that this varies strongly between different groups. Since about 2000, social security benefits in Netherlands have more or less tracked official inflation, and because of additional goodies that were introduced they are now better off than 10 or 15 years ago. For government workers incomes have been growing faster than inflation most of the time. This year teachers (with their already fat salaries) are getting a 5% raise, many other government workers are getting 2-4% extra and even some union workers are getting that +2-4%, while inflation is supposedly near zero. But for the self employed, people with temporary jobs etc. I have no doubt many are FAR worse off than in 2000 or even 1990. An additional problem is that – like in much of the West – the loss in direct income has been compensated by the housing piggy bank. Especially in the nineties, many Dutch households made more money from their home than from working. But this too works best for government workers with a fixed job, because of the mortgage tax deduction and other tax effects; and of course it cannot last in the long run. For self-employed people with declining income a mortgage can be fatal, especially the ‘maximum mortgage without down payment’ that every Dutch government workers aspires. Probably the nominal charts are about right for government workers, not so much for the rest of the population. Of course this cannot last too, I think it will stop as soon as the current NIRP/ZIRP environment ends, and government again has to pay for living beyond its means. According to Social Europe (which cannot be accused of “right wing” sympathies nor of being a Russian/Trump propaganda outlet), real wages in you country have been declining since 2011, with the pace accelerating ever since, a common trend in most of Europe. Between 2013 and 2015 Austrian, Dutch and Italian workers saw 2% of their real wages a year evaporate with no compensation. Social Europe also raised the question about how Germany and especially France collect and elaborate their data. In particular France seems to have been playing the “let’s under-report CPI figures” game with far too much enthusiasm, something Marine Le Pen has quoted several times in her speeches. I’m sure many countries use the same tricks for keeping inflation numbers down. Eurostat are among the biggest crooks on the planet, the Ministry of Truth could learn from them. This year health care premiums are up 10-12% with declining coverage, but government assumes it is only +3% which is used in the statistics. Rightly so, because people on social security and government workers get compensated for the increase. Rents have been skyrocketing for years, so the government uses ‘imputed rent’ instead which is asking homeowners (who are clueless about real rents) what they think they would have to pay for renting an equivalent home. And why not, only homeowners count, renters are scum. Education, energy bills, etc. – everything you cannot avoid and where government is involved has been going up far above official inflation for many years. Pension contributions are going up while pensions go down but again, government workers are fully compensated. Nobody talks about how people with private pension plans have been crushed in many ways over the last 15 years, let alone compensate them. Taxes on savings accounts go up again, the government now assumes you make at least 4% on a savings account, and 6-8% if you have more than 100K in savings while the real yield is about 0.35% max. But that’s only fair because savers are terrorists and they should invest their money tax-free in real estate, or in the stockmarket that thrives on inflation. Back in 08-09 after the first bubble burst many homeowners who were lucky to keep the asset, faced paying taxes on what the house used to be worth and not its present value? Such new things will have to be relearned again? It used to be that people went into business to get wealthy, now you go to work for the government or get elected to get wealthy. Debt works great as long as you have the two required tools of cash flow, preferably increasing, with which to service the debt, and adequate inflation to devalue the principal amount of the debt. It’s when the music stops things get sporty. Again according to Social Europe, the European country with the highest CPI since the birth of the euro has been Portugal, where CPI has steadily increased 3% a year since 2011. In the same time frame, real wages for Portuguese workers dropped 3% in 2011, a truly frightening 8% in 2012, 5% in 2013, 6% in 2014 and again 5% in 2015… note these are the new and correct data, as the “technical” government which run Portugal before the last elections had made “mistakes” with the data. This is hardly conductive to debtors: inflation may be acceptable, but the cash flow is not exactly encouraging. To this it must be added inflation throughout Europe is not uniform, for the simple reason the monetary component is just a part of it. In countries such as Portugal and Italy inflation tends to be higher than in Germany due to continuous hikes in sundry taxes and especially utilities and so called junk fees. Local governments cannot resist the temptation to make some quick cash at the expense of future income and allow private groups which paid large sums to buy former State-owned utility companies (often saddled with large debts and an excessive number of employees) to recoup their costs quicker by hiking supposedly price-controlled utilities. Our country has a different problem. The people in the country think the people in the city are spoiled and live on handouts? Yet the people in the country get an equal percentage of government checks as the city folk and also watch the same tube, which pretends that country is better than city? People in the city get no more than people in the flyover, yet the flyover is conditioned to recent development? As if city dwellers have inferior attitudes about working? working? Nicely stated. I believe you are correct in your analysis. City dwellers have more employment choices, they run one into the ground and just go on to the next. Someone mentioned quality of service. Also the past 8 years the recovery has been very uneven, while the major metro areas all but recovered and with plenty of jobs available, many of the smaller metros and towns in the flyover states did not see any of them. Hence why you have this weird situation of a housing shortage in the major metros but an oversupply of housing in smaller city/towns. If some companies would start moving to those smaller market cities the problem would be solved real quick. The problem with inflation measures is that they miss the key changes. We buy components for the products we make. The stuff now is awful compared to 10 years ago even. No life cycle left. Maybe a bit cheaper, but it just will not last. Our warranty claims have taken off. Every time we think we have found the issue another one pops up – usually made in china, but what else can you buy these days. Inflation measures do not seem to pick up the decline in quality. Take consumer products. I have shirts I have worn for 20 years that are still wearable. Buy one now and 4 washes later it falls apart. Buy a fridge now and in 5 years it is crap. So yes prices have dropped, and probably helped keep prices under control by official measures, but the cost per year, or use, has gone way up, way way up. Wish I still had the article. Lady wrote about a study she did – “Inflation by Degradation”. How we pay more for things not in dollars but in other ways such as reduced / poor service & support. She had several categories and examples. A big one was moving people to “self service” rather than have employees to help – you are now the cashier and bagger..
Ha, you touched upon my favorite! It isn’t even called “inflation.” It falls under “productivity” increases (do more with the same or fewer employees). It has been surgically removed from the CPI stats. The cost of the cashier and the person bagging your groceries used to be included in the price of milk and bread and whatever. When you go through self-checkout, it is no longer included in the price, but the price doesn’t drop. Instead, you pay the same price (at least) plus you pay with your own labor. “Productivity” increases, such as automation, should be deflationary (things get a little cheaper). But central banks make sure that they’re not. I used to use the ‘regular’ checkout at our local corporate grocer … until I got the brush-off by a cashier … because of my mentioning that i received most of my ‘news’ from select internet sites, such as this one …rather than the legacy outfits …. needless to say, I have since then used ONLY the self-checkout .. as I’ve contracted an acute case of stickittothemaniosis** …..
** I only use this retailer when all else fails. I White knuckle my way to sleep every night and wake up with larborer pains everyday! Wolf, I just finished reading a book called “Shadow Work: The Unpaid, Unseen Jobs That Fill Your Day”, written by a Harvard professor that talks exactly this. Anyone interested can pick one up at their local library. Yves Smith of the Naked Capitalism blog? She’s written a few articles on crapification. agree, and it’s not only the quality and product lifetime, the service has gone down the drain too while prices kept rising which also isn’t reflected in the inflation statistics. Don’t know about the US but in Europe e.g. bankings costs have multiplied while service level is zero compared to 30 years ago. Most of the economy has become a ‘self-service’ store which used to have a bad name when I was young but is the new normal for many ‘high end’ services including with the government. Helps the economy and its medicinal two for one. A bargain a cruster can’t resist! I purchased a Maytag fridge 3 years ago because it said it was made in the USA. It is a Westinghouse brand I believe. I remember as a kid the lonely Maytag repairman commercials who never had any work because Maytags were so reliable. In the first 2 years I’ve had to replace the ice maker twice and the drain valve once. The refrigerator replaced a 20 year old GE model that never had a problem until the condenser blew. Maytag sends me a solicitation to buy an extended warranty every 6 months and designed the system to try and force you to buy a new water filter every few months. Total POS but it is stable right now. And I will never, ever buy another one. The returns after black Friday were …….televisions! Go figure! Stand in line to get something 25% off on average and next day you are back in line to return it? Who…in their right mind would have created a ‘mandate’ to deliberately create inflation? Lets Take some money out of you pocket, go out in the backyard and set it on fire. There, don’t you feel better? Only with the FED, it is not a two dollar bill, it is a ten dollar bill under that two dollar bill getting destroyed. Where was the outcry on such twisted thinking? Disinformation and deception is bad enough, but when (basically) everyone goes alone with this crime….saying, oh well it is the way things are….they too are part of the crime. Get over this is idea that the ‘status quo’ is somehow in your favor. Brainwash, pure and simple. sources ( just look at this election how slanted the data was). Having had issues with eBay and Paypal settling two purchases, I find they have a checkout ‘glitch’ which will never be revealed. The guy tells me that the last week purchases were great, but as of yesterday about half are being returned. Lets guess what number will be used for ‘promotional’ surveys. My Mail lady tells me the same thing about Amazon, more than 1/2 are returns. Bet the stock analyzers will be heavy on the buy side today based on ‘designer’ data surveys. Boys, go to the store with your wife this weekend and feel the burn in your backside. What would really be ‘normal’ in an advanced economy because of productivity gains is that many products become gradually cheaper, the only exception being stuff where there are limits to growth due to supply, pollution issues, time constraints (some types of low-level work) etc. Deflation should be perfectly normal and we haven’t seen any since the bankers and their henchmen in politics took full control of the world economy around 1980 or so. Inflation is good for debtors whose debt carries a fixed interest rate (bonds, fixed-rate mortgages, other fixed-rate loans, etc.). So this would include the “speculators and owners of assets” if they’re leveraged. This also includes governments that borrow money (nearly all of them do). Note that assets themselves lose purchasing power through inflation. So inflation is bad for creditors – and as the article pointed out, for labor. yes, totally agree; I should have added the important part about debt and leverage. It includes a majority of voters in many countries and that’s why it is easy to continue these disastrous policies (disastrous in the long run, not while the fun lasts for speculators and debtors). “productivity gains is that many products become gradually cheaper” This is an illusion, and a well crafted one at that. Lets see (for example) my job is sent to China where the wage is 1/20th or less. But, I can buy that item that I used to make from some Chinese vendor on eBay for 1/10th of what it used to cost. Now, not only is my job gone but those wages to be spent in the USA are gone….the flow of money. To make it worse, this 4 pound item is sent from China for $1.65 including tracking. If I send a 4 pound box to Canada from the USA, it is $30 by FedEx and 46 by the USPO, from Florida to Washington State is a wee bit less. In the end, they are not cheaper, especially when you add in tax abatement that you have to make up but may be are not aware of. Outside of some electronic gadgets, nothing has benefitted. OK, Maybe for the CEO and company, but no one else in the big picture. In a market economy, competition will drive prices down and you will find an even better a job in a new and rapidly expanding company. Good for everyone. I’m not talking about ‘productivity gains’ by shifting work to low wage countries, but gains from technical innovation (sometimes including automation) which should be perfectly normal in many fields. It’s not just in electronics, you can see the same in many consumer products where efficiency in production has increased tremendously irrespective of wages, e.g. most consumer stuff involving basic chemistry. As to transportation cost you mention: this is indeed a big issue that indicates stealth subsidies and trade barriers from several sides. I ran into this myself years ago when reselling small tech products, which simply became impossible. If I buy from an official Dutch distributor, I pay e.g. 10 euros for the product and have to take at least 10 of them, and pay shipping/ordering cost of around 10-20 euros. Then I ship one of these products to a customer, maybe in a nearby town, which costs 7 euros just for shipping to the bill is now 18 euros plus taxes plus my profit, which makes about 25 euros minimum. The same product can be ordered from China for maybe $2 including shipping, and is delivered to the customer by the same postal services that charge me 7 euros to a nearby town, no VAT taxes or customs charges involved as long as the value of the product is low. It’s impossible to explain the price difference to the customer, they simply expect to get the same or similar price from a local supplier (including free support etc. which is difficult to find from a Chinese supplyer). I could buy directly from China, do my own marketing etc. but the shipping cost within my country alone makes it impossible to compete … Many similar problems can be seen with more expensive products as well. You mean consumer electronics? Single largest category of Chinese imports about 27% of total. Outside of a few hi-fi niche products there is no US consumer electronics industry, and it has little to do with China. The US was taken out by Japan 25-30 years ago. Last TV made in US 1995-by Zenith, but majority gone years before. Now China and South Korea have mostly taken out Japan- Toshiba just exiting TVs. This is very low profit biz. Next category of Chinese imports about 17 %- budget apparel, shoes etc. Again, outside of luxury or specialized niche players- there is no US industry to protect- nor would anyone pay the required prices. The only people in the US likely to either do electronic assembly or clothing panel assembly (sewing) is the same group picking strawberries and lettuce- illegal immigrants. This get ‘rid of Chinese imports and the rust belt revives’ is snake oil being sold by an experienced seller of same. If one was determined to save a US industry that actually exists, by taking on foreign competition, try autos. Wolf Street in the last few days has run a number of posts about the looming crash in the industry and its huge finance arm. Note that Abe in Japan has openly told us that one of his ‘three arrows’ is a weaker yen- a bit of departure from normal protocol- you aren’t supposed to say ‘I’m stealing a cookie now’ even when everyone knows you are. And the euro looks to be weak for a while, making German cars ex-luxury cheap. e.g, Jetta from 16,900 Canadian so ? US$. How much longer can the Big Three (or 3.5 FC) hold the fort against Japan, Germany and increasingly South Korea with a high dollar? But taking on these real competitors isn’t as popular as blaming China. During the 50’s numismatics experts analyzing Byzantine gold coins (s. nomisma, pl. nomismata) from the X and XI century made a surprising discovery: the gold content in these coins steadily decreased over a century, averaging a 1.5% loss/decade in weight. Since the days of Leo III the Isaurian (r. 717-741) gold content had been stable at 97%, so this was obviously not a technical issue. This presented a problem to numismatics and historians, as common consent at the time was that until the modern age such a thing was impossible to pull. Over the intervening decades the truth was pulled together. First of all it was confirmed mints in Imperial Rome and Parthian Persia already had the technical skills to reliably alter gold content by as little as 0.1%. As Byzantium had access to Roman technology and improved upon it, this was no big technical problem for them. Second of all Cécile Morrisson, the foremost expert on monetary systems of the Mediterranean Middle Age, coined the expression “creeping debasement” to define this policy, which was basically aimed at adding a stealth tax through seignorage, meaning the difference between the cost of producing money and the face value of it. Byzantium at the time was fighting a series of mostly successful offensive campaigns against Arabs, Bulgarians and Slavs, but the internal situation was as volatile as ever, as proven by how even a powerful and successful ruler as Nikephoros Phocas could be murdered in his own bedchamber by his own generals. A stealth tax was a good way to raise extra funds while maintaining plausible deniability. Basically nothing new to see here but the fact these days we have computers and at least we don’t blind deposed rulers. Battelles first break thru was cutting pennies with zinc around 1913! The technology was loaned to the tank boys so their tanks didn’t get destroyed during the first war? Fun fact; every noble prize winner for materials going back to 1913 was hired by Battelle! Our entire technology base was first in the German papers brought to wright patterson for study by Battelle after ww2. One can only surmise the plan was to make the poor poorer, and the middle class wither on the vine, since both are stuck in lower hourly paying jobs. Inflation helps the rich, no one else. Henry Ford understood this basic principle, and paid his workers enough so that they could buy one of the cars they were building. I believe this story is a myth. My understanding is that, at the time, the idea of working on an assembly line, performing the exact same repetitive function 6 days a week for 10 – 12 hours a day, was considered horrific to the average person. People at the time were coming off farms where a man needed a multitude of skills, and craftsmen had the pinnacle of respect. And because of this, plant turnover was so high that it seriously impeded efficient production. So raising wages to compensate for the brutal existence was a necessity. I’ve read that the purpose of the public school system in the ’20’s was really to train Americans to be on time, perform repetitive functions without complaining and respect authority. Precisely: high wages were required to keep people on the job, as early on the Highland Park assembly line had an extremely high turnover rate, about 90% among newly hired in 1913. Ford also introduced a system to reward workers who stuck with the company: in 1913 a newly hired earned $1.50/day which became $5.00/day after three years with the company. It was nice money for “general” labor, and it had to be as somebody looking for work at the time had plenty of opportunity without moving too far from Detroit. Aside: The Ford Highland Park plant built Ford model 8N farm tractors in 1951. I worked on the assembly line there and devised a method to distribute the nuts and bolts I applied to each tractor as it passed my station on the line, so as to minimize lost motion. It saved enough time that I could sit down to await the next tractor. BIG MISTAKE! The guy in the next station got fired and I was given his job to do in addition to the one I had “improved”. Oh well. In those days, assembly line workers were laid of and hired somewhere else in the industry, as temporarily needed. I was laid off, eventually working for Chrysler and GM’s Cadillac Division. A commentary upon the speciousness of our time: The Highland Park plant is now an “historic landmark”. Wonder how much Ford gets in tax breaks for that “donation”? Diego Rivera (one-time associate of Leon Trotsky before he was assassinated in Mexico) was lionized as he did a mural on the walls of the Detroit Institute of Art, depicting laborers on assembly lines. Progressive Horace Mann was all the rage in educational theory – in fact, the first elementary school I attended was named for him. You’re right about the high turnover but I don’t think it’s a myth. Ford wrote “We increased the buying power of our own people, and they increased the buying power of other people, and so on and on,” … “It is this thought of enlarging buying power by paying high wages and selling at low prices that is behind the prosperity of this country.” From “Today and Tomorrow”. He saw beyond his own narrow interests. “children to grow up to be sheep and follow the commands of the NWO types”. Looks like a successful project. Cheap local labor actually has another name where the government supplies a safety net of welfare, for instance in the UK ‘Cheap labour’ actually equals ‘Corporate Subsidy’. Firms compete with one another so for wages it’s a race to the bottom, and the bottom is underwater for most. It’s government welfare, tax credits etc that bring people back to the surface, for which there is only one solution: Minimum wage. Without a decent, subsistence level Minimum Wage the taxpayer as a body is subsidising corporate labour costs. This is why – for better market and capitalism, ironically the centrally mandated minimum wage is a vital tool to level the playing field between company, customer and taxpayer. The corporate subsidies of low pay are a curse on any nation. “… for better market and capitalism, ironically the centrally mandated minimum wage is a vital tool to level the playing field between company, customer and taxpayer.” – Graham. Also ironically, the downside of minimum wage laws is that the increased cost to business is obviated by elimination of minimum wage jobs. Those government inflation percentages are truly imaginary. The also miss the fact that the quality of goods goes down to hide increases in costs that don’t get passed on into prices. And, lower quality good break and wear out faster requiring earlier replacement. If you want to track inflation read a women’s fashion magazine. Even when you ignore the $1K shoes and $5K handbags, there is still the $30 lipstick, the $20 nail polish, the $100 bottle of watered down perfume. These are all items most women buy and consider necessities. A trip to the hairdresser is at least a $100 affair. The people who make the least, get gouged the most. Depends on how you look at the subject. e.g. for cosmetics the production cost is just a small fraction of the final consumer price, even the bottle is often (far) more expensive to make than what is inside. Which also means that the difference between the cheapest and most expensive product (e.g. perfume) is mostly due to marketing expenses and markup by the vendor chain. In cosmetics there is no relation between price and objective, practical performance. However, many customers want to feel beautiful/great by buying the most expensive brands, associated with their favorite stars etc. You are wrong that there is no difference in cosmetics at different price points. Expensive nail polish and lipstick last longer, I know from personal experience, and the color selection is more appealing. Branding does matter because of quality, not because of price. Chanel is ridiculously expensive but also high quality. Lancome is good enough quality at moderate prices but not at high prices. If the perfume doesn’t smell good and last, it doesn’t matter how pretty the bottle may be. Most of the cheap end is interchangeable and that’s where the hollywood star brands are represented. Expensive products CAN be better, but in general there is no clear relation between price and quality. I have seen several extensive comparisons lately and sometimes the cheapest products are as good as the most expensive ones; consumers usually cannot spot any difference when the packaging is removed. While not all expensive cosmetics are good, most of the good ones are expensive. The only cheap item I used religiously was a drug store brand of mascara. Now it is downright dangerous, it burns after a few hours. Add it to the crapification list. Expensive perfumes smell the same close up or far away because the have good fixatives in them. Cheap ones can be dramatically different (and always for the worst) when you get some distance from them because they don’t use fixatives and use synthetic chemicals for their aroma. If you wear perfume, wear the good stuff! Hee hee! No I don’t wear perfume but my sense of smell is very acute and women mistakenly economizing on perfume have no idea how much they can torture those around them, especially if they really slather on the cheap stuff. P.S. I don’t wear anything except a little antiperspirant. Keeping yourself clean and well washed is the best frangrance, at least for a man. Out of line maybe (probably), but an article in “News by SRSrocco”, Nov. 3, 2016 should be of interest to all: End of the U.S. Major Oil Industry Era: Big Trouble at ExxonMobil. Opens eyes about what this bunch is doing and where it is probably going. Thanks so much for your work at grinding through crap to get some real world numbers for all who care about the future of our kids and grandkidlettes. That blue line looks like the inverse of the oil price chart. Probably not a good sign, considering that for the moment we are coasting on the investments made when prices were higher, not investing anywhere near enough to sustain production levels into the future, and that even if we can find enough oil at a price we can afford, it will fry the planet to burn it all. Where ‘official’ data is suspect proxy data is used, e.g. economists suspicious of Chinese GDP data looked at rail shipments, electricity generation etc to see if those were growing in line with official GDP. Is there any similar data for household standard of living? Say square feet of housing per capita or residential electricity use or meat consumption per capita that are independent of CPI ? Moving from a 2500 square foot house to a 1200 square foot condo could show a similar monthly rent just as using a Jimmy Carter thermostat ( 78F in summer, 68 in winter) would purport to show the same level of ‘comfort’ but the reality is somewhat different. But it is extremely difficult to draw conclusions from such numbers, e.g. price per square feet is supposed to be higher for high end properties, but in my country it often works the other way round because the most expensive properties are large (often old monumental buildings) and you pay relatively little for the extra space over a certain minimum. Many things changed over the years that are difficult to judge, e.g. it might be that lately people prefer smaller homes and because of that want to pay a premium for a small home, or try to avoid the large homes because of the sky-high energy bills. Also people moving between inner cities and suburbs – related to lifecycle etc. – have strong influence on the statistics. Electricity use same story, an expensive home might be self-sufficient while an older home could have very high electricity bills because it needs airco and/or electric heating. Affluent people might be home relatively little and only watch TV for a few hours at most per week, while people on social security maybe have the TV on the whole day for watching movies, gaming etc. Technologies around the home vary over the years and even in the last 30 years so much has changed (at least in my country) that the data would be very difficult to interpret. I do know that about 100 years ago, the average person in my city had 4 square meters of living space. It’s now 40-50 m2, so over ten times more – BIG change. And probably in parts of the US and Europe even 40-50 m2 is low nowadays but probably huge compared to much of Asia. The home where I grew up in the seventies probably had 5-10 inhabitants on average over the last few centuries, it had over 20 inhabitants around 1960 (living in very bad conditions), our family of 7 in the seventies and only my old mom now. Much of that is typical of the whole area in the inner city, many large homes (typically 200-500 square meters) with just 1-2 occupants. But e.g. former migrants in a neighor city might be living with huge families in homes of just 50 m2 (or even more if you include illegal occupants). But I would love to see more reliable data than the BS the government presents us, because you know they only show what they want to show. Even though I am one of the few Americans that ‘thinks in metric’, I never converted my 1919 Sears Craftsman bungalow (bought for $600 and built by the first owner(s) to square meters. Living large in 125 m2! For 13 years, our family lived in a Sears catalogue “Dutch Colonial” near Warrenton Virginia, about mid-point in an odyssey from the factories of Detroit to the mountains of WV. That sir, is a Nobel prize winning statement. On another topic, it would be extremely useful to overlay the medium household incomes in different countries with different currencies. It would show how far globalization can still go. “…an economy that is based on consumer spending has trouble growing if the purchasing power of these consumers is sinking into an endless inflation-induced wage-quagmire.” Which is why a mandated 2% inflation rate is exactly the wrong prescription. Steady CPI DEflation would’ve allowed the “deplorables” to benefit from globalization and created a higher real wage. Banks and Government could not permit it, however, because it threatens their power. When I was younger (1960’s) I made the decision to lead a life of voluntary poverty. So far it has been great—good family, lots of friends, meaningful work (self-employed farmer), opportunities for charity work. 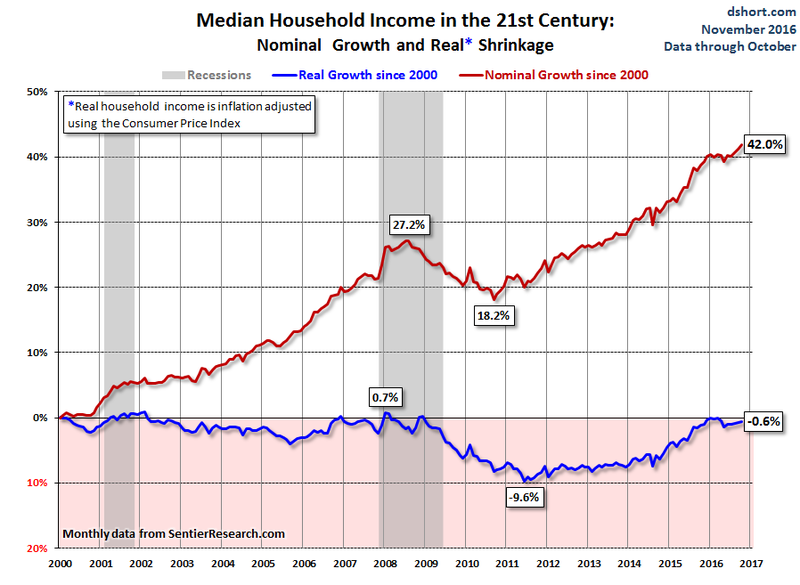 In recent years our household income is about $20k, which is more than enough. So I am puzzled why people are complaining that their income ($52k) is the same as it was sixteen years ago. Wasn’t that already way more than enough? Do people really think that having a big house and three cars and a boat and a big TV has any relationship to the quality of life? By both historical and global standards, Americans are ridiculously wealthy. What’s the problem? Though many of us might want to live on a farm, only about 2% of the US population does. The remaining 98% lives in urban areas. And urban areas have a thing called “cost of living,” which can be VERY high, depending on the city. Wolf, if many of us wanted to live on a farm, we would (BTW, rural living is not necessarily on a farm). But most do the conventional thing and go for a conventional American urban or suburban life. old farmer and I (among millions of others) are demonstrating that. Wage slaves have to live in high cost of living areas in order to pay off those student loans. It is like a prison, once you are in, it is very hard to get out. What’s the problem you ask ?? Everyone bought the Bernays sauce …. and it’s been downhill all the way ! FORWARD .. INTO THE DITCH !! I’m in Europe and I pay 20K in yearly taxes with zero income, not counting consumption taxes (VAT) etc. And in my remote part of the country, a tiny farm with an outdated farmhouse and just a few hectare of land will cost over $ 1 million and I’m sure it would be impossible to make a living from such a small farm nowadays (I’m told that over here 100-200 hectares is the absolute minimum); if you can’t pay cash no one is going to lend you the money for it. I think you made a good decision, but this is no longer an option nowadays in most of the developed world. The fact we have such options in the U.S. makes the American left’s haughty pronouncement that we are not an exceptional country quite annoying. Not exceptional? I don’t know anybody on the Left who says anything remotely like that! Have you ever met a real Socialist? They hate the Democrats with great fervor, especially Obama and Hillary. The Democratic establishment is very right wing-police state, gung ho-Neoliberal Capitalist and very anti-democratic and pro wall Street, Please don’t mistake them for “the Left”. The real Left doesn’t! To J bear: the fractionalism within the left of all stripes is like that within religious sects. Oddly it gets more intense if the creeds are close- Protestants and Catholics have persecuted each other more than either has persecuted atheists. This is known as the antagonism of near relations. Socialists hate Democrats? No doubt, and Socialists are repelled by Social Democrats and Communists hate Socialists. And Bolsheviks hate Mensheviks. This so PO’d off Lenin that he ordered factions to dissolve- not with complete success. The Party split again between when one time leader Trotsky resisted Stalin, and for years the Trotskyites remained vermin, far worse than any mere capitalist. During the inter-Communist feud between China and the Soviet Union, the broadcasts aimed at each reached a level of hate speech complete with obscenity exceeding that leveled at the US. The high point of the American Communist Party was the 1930’s. Politics like life is often about the choice of the least bad. Not understanding this allows or even begs the worst choice to divide and conquer. If the Democrats had won in the US, they would have had to move somewhat in the direction of Sanders. Even though some Socialists probably hate him too. And now they’ve got Trump. Buying online (automation) and subsidized export of manufacturing overseas, suppresses wages. It’s pretty easy to make a list of various other causes.